Paying tribute to Russell Westbrook’s late teammate and best friend, Khelcey Barrs III, is a “Tribute” colorway of the Jordan Why Not Zer0.1. Dressed in their high school team colors having a mix of Midnight Navy, Metallic Gold and White. 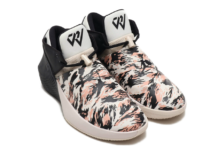 This Jordan Why Not Zer0.1 also includes both Westbrook and Barrs’ numbers featured on the outsole and “KB3” on the tongue in Westbrook’s handwriting. Look for the Jordan Why Not Zer0.1 “Tribute” to release on March 11th at select Jordan Brand retailers. The retail price tag is set at $125 USD.